Huge new sunspot may hurl flares towards Earth | Watts Up With That? Sunspot AR2736, which hurled a Coronal Mass Ejection toward Earth yesterday, is growing larger and crackling with C-class solar flares. 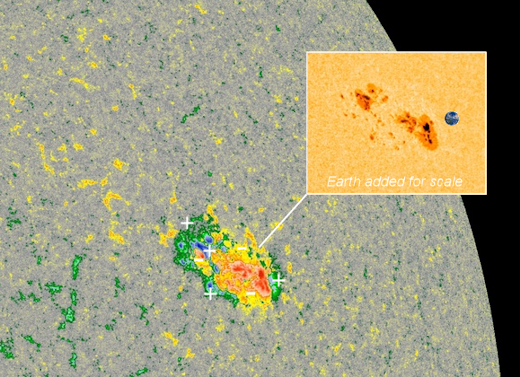 The active region now sprawls across more than 100,000 km of the solar disk and contains multiple dark cores as large as Earth, making it one of the biggest sunspots in recent years. Sunspots are islands of magnetism floating on the surface of the sun. Most sunspots, like most magnets, have two poles + (N) and – (S). Sunspot ARorio2736, however, has multiple poles with areas of + and – jostling against one another. This is why the sunspot is crackling with flares. Magnetic field lines of opposing polarity criss-cross and explode–a process known as magnetic reconnection. In the grand scheme of space weather, C-class solar flares are not considered to be major events. However, these explosions are noteworthy now because the sun has recently been so quiet. Solar Minimum is underway. In context, C-flares represent a real uptick in solar activity. They can ionize the top of Earth’s atmosphere, disturb shortwave radio communications, and even hurl CMEs toward Earth. Indeed, one is heading our way now. Prediction: March 21-22, an SC24 active region will rotate into view and go bgd-magnetic classification and pop-off a few M class flares between 22-27 March. 2 Weeks ago, I was off by 1 day on its formation from my hypothesis. No wiggle matching. No bary-whateverism-astrology. Hard MHD physics. From the Space Weather link above there is an image “STEREO Ahead COR2”. It indicates the CME on the right side of the sun. On the exact opposite side is something. Is it a CME? Is it a coincidence? STEREO-A is now behind us in its orbit. Exactly 93.9degrees “behind” us right now. So to the right of STEREO-A’s view of the Sun is Earth. STEREO-A has a solar orbit of about 0.94 AU, so it runs inside the Earth’s orbit. And STEREO-B has an solar orbital distance of about 1.07 AU, and it runs slower around the sun than Earth. STEREO-B has been lost since October 2014. It’s probably gone for good. But the Earth will gradually catch-up to it, and I’m sure someone at NASA will try to contact it again as we pass it. For CME’s I like to watch SOHO/LASCO C2 and C3 coronal images (available on the SWPC links). Better resolution than STEREO. But STEREO-A now has the advantage now of being in a good position to monitor an Earth-directed CME. Congratulations, Joel! Now can you predict some lottery numbers for me? Lol! Sorry, but his record is totally spotty. That’s the only solar AR flare prediction I’ve ever made. So we’ll see. Most physicists would be incredulous at the mechanism. I was too. I still am skeptical. I worked back through historical data that kept telling me I was on to something worth making atestable hypothesis. This AR 12736 is just one half of that hypothesis though. But it’s just a hypothesis. Not yet ready for prime-time. So I’m certain there are things I’ve missed, and don’t know what I don’t know. And the triggering event at the core of the hypothesis is still very much a work in progress. The cool thing though is the hypothesis has a very specific prediction to go with it so far. One that will be verifiable in about 15 months from now (June 2020). That means I think it has already happened, we’re just waiting to see the fireworks. Your pun filter needs tuning. You do realise that you are breaking all the rules of climate science by: proposing a hypothesis; making predictions using that hypothesis and then comparing your prediction with the real world. All that whilst remaining sceptical of your own work. Richard Feynman would have been proud of you! Way above my head (!) But I do love reading something from a proper scientist. A hypothesis, a prediction, and a result. You will never get a paying job! Loved the “don’t know what I don’t know” enough of the modesty. Everything starts with a hypothesis in Science. Then other scientists play Whac-a-Mole to falsify it. LOL!!!! Now that’s just funny! PowerBall: 10, 14, 50, 53, 63, and PB 21.
buy the ticket and split it with me. So you are saying that you have a model or a hypothesis that you wish to compare with real-world observations. It will require more than one prediction before people will begin to take it seriously. Don’t despair, time and careful observation will prove if what you are proposing is a viable explanation of the underlying physics. By the way, many people noticed that the west coast of Africa and the east coast of South America appeared to fit together like pieces in a puzzle. This was an example of wiggle matching that led to a revolution in geology. Wiggle matching and the observations that “bary-whateverism-astrology” may suggest a link between one physical phenomenon and another are valid scientific tools. They may not be the sharpest of tools but they are still useful if used carefully as a guide to point towards possible underlying physics-based mechanisms. At first, I was excited that the sun might be returning to higher activity levels. Nothing like the sunspots of the 1980s and 1990s. Here’s hoping for higher activity levels; but I’m not holding my breath. On this AR 12376, the sunspot number is now as high as it was in that first week of September 2017 when we got the largest X-class flares of SC24, and a nice pinging of the Earth’s geomagnetosphere as the Ap/Kp values went ballistic. They will do so again Saturday and Sunday as that weak-moderate CME hits the Earth. NOAA/SWPC is predicting a G2 level geomagnetic storm for Saturday. Will make for nice auroras as far south as the Dakota and New York, clouds permitting. If we do get another Earth-directed CME from this thing, the first CME can act as “plow-the-path” through the heliosphere for subsequent follow-on flare-CMEs events to reach Earth with even more power (e-fluence and proton energy) than they would as a singleton. Just something to keep in mind. But AR 12736 will be rotated on the limb by Sunday and out of view by Monday regardless. And with STEREO-B out-of-action, we won’t know any thing from this AR after that. Galactic radiation is constantly growing. As it always does during minimum between cycles. Nothing out the ordinary. From what I’ve been tracking over the years of your writings, this isn’t anything all that unusual. The “Interregnum” between Solar Maxima is a time of quiet punctuated by remarkable, and blessedly few, sun spots sometimes of outrageous power. Having such a “crackling monster” developing (and thankfully according to the ‘movie’, heading toward the east-to-backside rather nicely), really shouldn’t be considered unusual, or as I understand your position, particularly indicative of anything portentious at all. Just a great big plasma loop, welling up from the Deep Interior, to vent its energies almost-certainly harmlessly against the plane of the Ecliptic (the spot being fairly equatorial). But not really unusual. The unusual part is just how weak Cycle 24 was. And tho’ you’ve not yet confirmed it, how possibly weak C–25 might be. No, large CMEs and flares are not unusual near solar minimum. The old gal still has some wind left in her sails. Meaning we have not crossed into cycle 25 yet ? That thinking that the Sun is unusually quiescent in this between-Solar-Max time (AKA: minimum) is just short sighted. Sol’s enormous poloidal and current-sheet (only a ghost-of-a-shadow) magnetic lines are churning away deep under the apparent-surface. Those currents, tera-amp, far-larger-than-earth’s-volume outraged plasmas continue to gin up the dynamo anti-gravi-thermodynamic, anti-inertial, anti-homeostatic and almost incomprehensibly tangled Maxwellian tensors to where every once in a not-so-unusual-time, the Solar Minimum generates very few, but astoundingly powerful outbursts demonstrating the conservation of energy, inertia and momentum. Got to love Old Sol. She’s a fine old star. G2V, so it is said. I was thinking drop and roll…..
Tin-foil hat w/a ground wire. Where do you attach that ground wire? Ink-wiring minds want to know. Space weather is the important metric here. Though powerful flares that hit us straight on can be, rarely, a pain in the rear end on Earth where we walk and breath. HOWEVER! The older I get, the less enthralled I am with electronics. If the damn thing cuts out my puter, cell phone, and satellite TV, I just go fishing! Fish don’t care, and I don’t care. Some days I’d really like to be back in 1966 again. How are the activists going to blame this on anthropogenic CO2? Simple: anthropogenic CO2 —> increased global warming (sole cause) —> more water evaporation from Earth’s oceans —> higher relative humidity —> greater extent of Earth’s cloud cover and greater precipitation of snow —> overall increase in Earth’s albedo —> greater incoming solar radiation that is reflected hemispherically back into space —> increase of that portion of Earth’s radiation energy directed back directly at the solar disk —> delta increase in energy at Sol’s surface that is facing the Earth —> trigger for sunspot(s) and accompanying solar flares. It all has to do with SSCSER (Solar Surface Climate Sensitivity to Earth Radiation) . . . specific details to be provided later by those skilled in the art. I see the celebration light display, I requested was approved. Should look fantastic on the 29th March at 2300.hr ;-)….. According to my findings the UNFILTERED polar field strength should have gone up in February…. 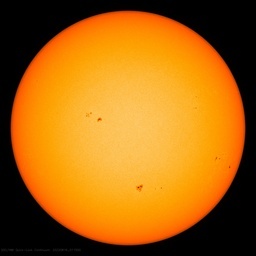 This is the reason there are no sunspots and that we will have A MUCH LARGER SUNSPOT CYCLE THEN EXPECTED. We will know in a month…. https://www.raben.com/maps/ provides a lot of information about current sunspots. According to that site, sunspot 12376’s magnetic field has a beta-gamma-delta configuration. That’s about as unstable as it gets. Plasma jump will occur on March 23. The speed of the solar wind will increase little. Leif Svalgaard is right. Best regards. For me layman having at best half a percent of a clue concerning solar aspects, the synthesis of all these informations provided by Leif Svalgaard, Joel O’Bryan and Patrick Geryl are really helpful.